The Nat Sherman Panamericana was originally a cigar line only available at the Nat Sherman Townhouse in NYC. Years later, the Panamericana blend became available to TAA retailers as an exclusive offering. As the line grew, I was able to smoke several sizes (including the Secretos, reviewed here) and I’ve been looking forward to the Rubustico to complete smoking all the vitolas. Stout, dark and veiny, the Nat Sherman Panamericana Robustico is a solid squat smoke full of tobacco with no soft spots to speak of. The band is lime green, red, browns and gold which I do not find particularly appealing, and the “Nat Sherman New York” logo is clearly present on the front. The design does not seem to strive to impress in my opinion with the somewhat off putting color scheme. I’m thinking 70’s leisure suits when I see it. Nevertheless the proof is in the smoking. Lighting up the Nat Sherman Panamericana Robustico, you are greeted to pencil lead and cedar. There is an earthy presence as the cigar picks up with a touch of sweetness that starts to develop. The ring gauge aides in surrounding the palate with bready notes and a short finish. Smoking past the second half mark, there is loads of milk chocolate coming through that lingers on. Coffee and cedar dominate, bringing the complexities of the Robustico out, and there’s more graphite and wood interplay as the cigar picks up. For a short smoke the development is impressive at this point. On the final third, the earthiness builds up and the cigar is a bit gritty at this point. The wood notes shift to be a bit charred despite my smoking the cigar slowly. Near the end, the flavors become linear with no notable changes leading to a bitter finish. A disappointing ending to an otherwise flavorful smoke. 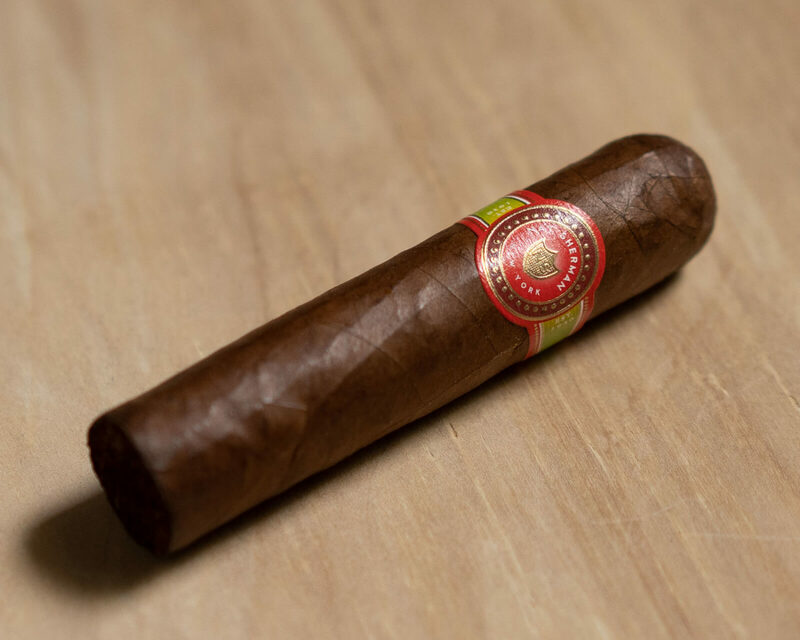 The Nat Sherman Panamericana Robustico presented a flavorful start with cedar and graphite while delivering an attractive sweetness. The milk chocolate and coffee added to its complexities midway and enhanced the blend. What hurt this cigar was the last third of it turning rather bitter and charred. Short smokes are a pleasure when they can deliver complexities and flavors in an abbreviated time frame. The robustico achieved this until its final third which hurt its score. I would advise giving it a try in the hopes the finish is a better experience for others.